The kit includes four stainless steel Swiss Clips, four stainless steel Swiss Corner Clips, string, and a hanging bracket. Use Corner Clips on the corners as the main support system. Use Swiss Clips in the middle and on each side to prevent bowing. 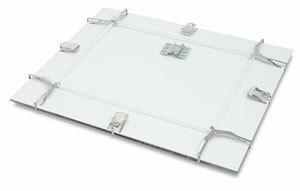 Supports artwork up to 60 lb (27 kg). Clips will hold materials up to 3/8" thick.